Acquisio is a really good platform to manage search and display campaigns, but it is probably not the best if you want to manage social advertising. If you are really savvy with reporting I would strongly recommend the use of Acquisio. 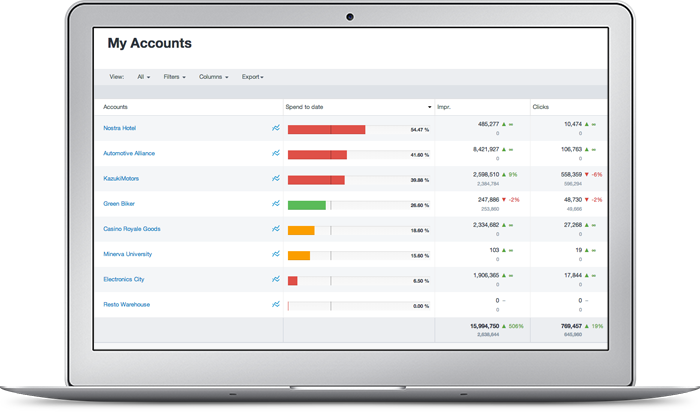 You can make custom reports and send them automatically to your customers. That gives you more time to focus on optimization instead of reporting. Reporting - robust reporting suite that saves hours every week. BBM - manages campaign budgets and optimizes bids. The few times we needed assistance from our Account Manager, it was not good at all. You won't be able to get them on the phone. All problems are addressed via email after long waits for responses. I wouldn't recommend Acquisio for novices. Having had sync issues several times in the past, and with the recent Flash incompatibility issue, if there was a way to generate reports that had the same high level of control and professional, streamlined look, with less time investment, we would look into it. We have a dedicated account rep. She makes it seem like we are her only client, she is very responsive, helps each time we have a question and understands our campaign goals. Anytime we need support, our rep is available either email or call and if she is not going to be available, she will let us know ahead of time to provide back up and inform them of our current campaigns so they can better assist us. There are a ton of tactics and strategy to implement in the DSP platform. There isn't really a selection of the different types of campaigns or tactics to choose from, you just have to learn as you go. Once you figure out the strategy and goal of the campaign it is very easy to implement the tactic and to achieve its goals. I would say it's had a positive impact, since we can aggregate ROAS data more easily for eComm, especially. Basis DSP allows us to reach users in many different places while controlling costs - access to major exchanges at a competitive bid rate allows us to provide a lot of added-value to clients without dramatically increasing the cost they incur. The team is friendly, helpful, and responsive, so we don't have a lot of situations where we're locked in campaign downtime due to a customer service issue with negative downstream impacts to the bottom line. Periodic reporting outages have resulted in campaigns that overpace and incur needless costs (however, this is certainly an exception, not the rule).